This book, which brings together contributions from over 25 scholars from the TEPSA network, sheds light on the political dynamics within the EU member states and contributes to the discussions about Europe. Authors from all member states as well as Iceland, Norway, Switzerland and Turkey assess how their country could get more involved in the European debate, taking the reader on a journey through various political landscapes and different views. The book includes a Foreword by the President of the European Parliament, Antonio Tajani. The chapters cover issues ranging from a perceived lack of ambition at the periphery to a careful balancing act between diverse standpoints at the geographical centre. Yet, discussions share common features such as the anxiety regarding national sovereignty, the migration and border discourse, security concerns as well as the obvious need to regain trust and create policies that work. 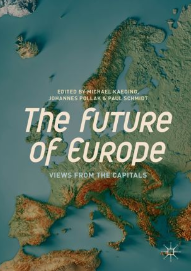 The book contributes vigorously to the debate about Europe in all capitals and every corner of the continent, because this is where its future will be decided. You can get the eBook here or at SpringerLink, where it is free to subscribers.